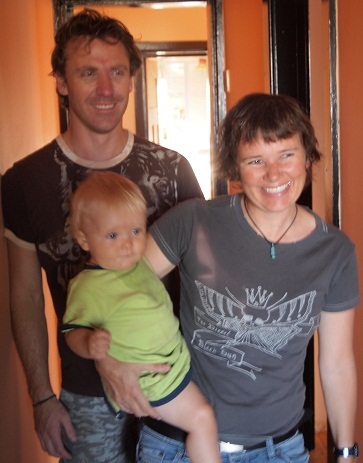 On Tuesday morning we said goodby to John and Rita and cycled into Cape Town. It was only something like 20 miles, but all of it in traffic and much of it in the city, which sprawls on forever. Our first couple of tries at accommodation were unsuccessful, but we ended up at Riverside Lodge, an International Hostel that wasn't too bad. We wandered around a little in the Observatory area in early evening, and for supper I brought back some good sandwiches from a nearby cafe. Observatory is a funky, interracial and international area; we liked it well enough, for a city. 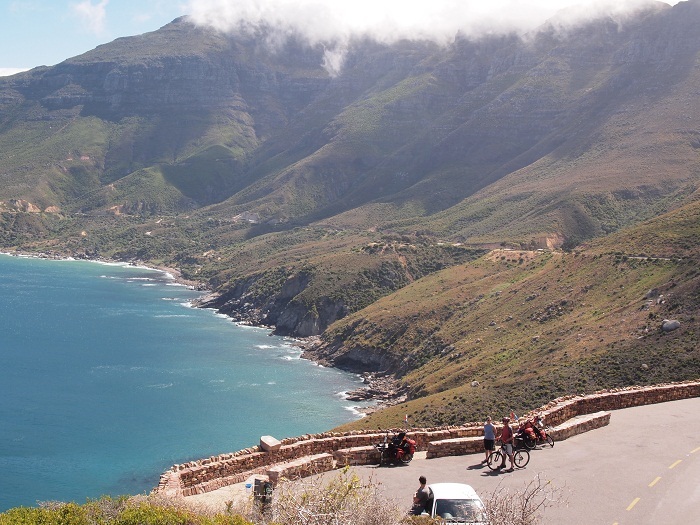 Wednesday we rode back out of the city, this time to the south, aiming for the Cape Peninsula. 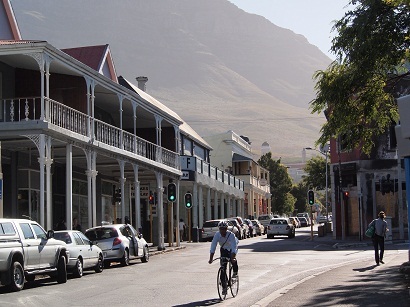 Even when we escaped Cape Town, we didn't like it much because the area around Muizenberg was very built-up, with houses and high rises lining the coast and a train track between the busy road and the shore. Beyond Muizenberg, after a series of tourist towns that blur together in our minds, we reached Simon's Town, and it was much nicer, we thought. Smaller, no more train tracks â€“ more comfortable for us. We stopped at Boulders Beach for our first swim in the South Atlantic. 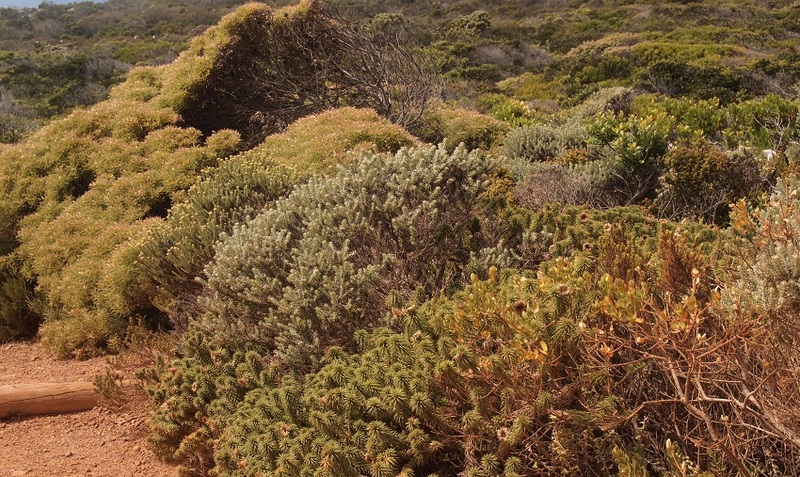 There was a â€œholiday resortâ€� where we'd intended to pitch our tent â€“ but have I mentioned the wind? It was roaring, and we used that as an excuse to rent a shabby little â€œself-cateringâ€� rondavel-style cottage at the resort. I thought it was overpriced, but then it's location, overlooking the sea, made up for a lot of deficits. We took the place for two nights, to serve as our base for a trip out to the Cape of Good Hope. Wednesday evening, after a dinner of take-out from the village, we walked along the rocky shore, below a protective fence that's meant to keep penguins from getting into the road. It was beautiful in the evening light, and we saw many penguins. They're such comical birds, and we were able to get quite close to a few of them. Unfortunately it was growing darker, so our photos are not good quality. 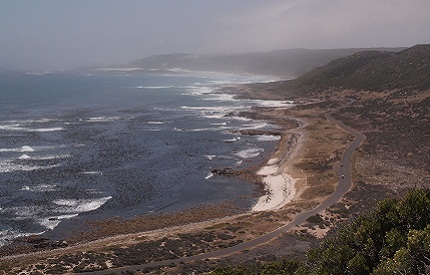 The ride to the Cape of Good Hope National Park on Thursday was slightly uphill against a moderate headwind. It was quite cloudy when we started, especially at the tops of the mountains. We arrived well after noon at Visitors' Center. 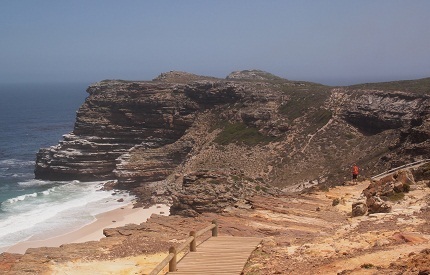 From there, trails led up to Cape Point, where there is a lighthouse, and out to the Cape of Good Hope. The trail to the point was fairly steep, and we didn't bother with it, but we were amazed by the number of people who paid good money for a funicular ride to the top â€“ a walk, albeit steep, that was supposed to take only 15 minutes. 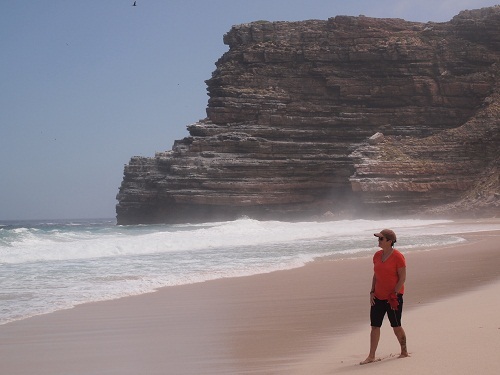 Instead, we walked the one-hour round trip to the Cape of Good Hope. Words fail. The weather had cleared, the sun was brilliant, and it was a wonderful experience.Besides the great views, there was a feeling of immense spaciousness. We stayed out at the Cape for a while, took some pictures, and then, on the way back, walked several hundred steps down to a gorgeous beach. Signs said it wasn't safe for swimming, and the water was fairly cold anyway, but we waded a little just for the symbolism. 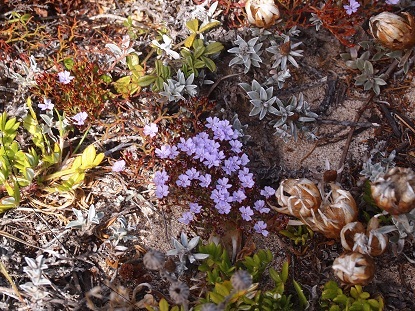 We are gradually coming to appreciate what's called "fynbos." 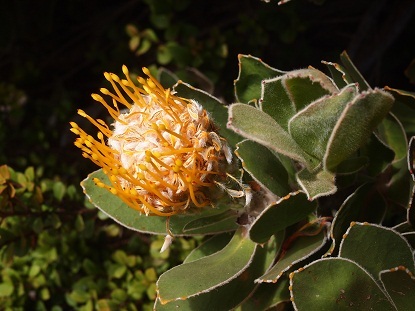 This Afrikaans word means fine bush, and it's not a particular plant, but ecosystems of low-growing plants that thrive in the southern Cape. Below are examples. 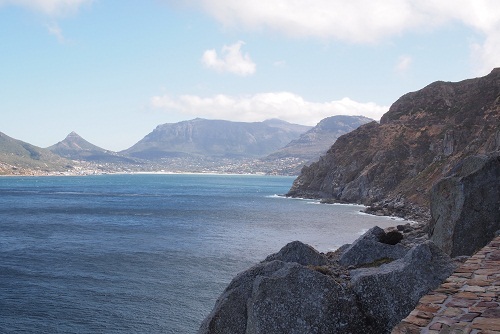 Friday morning we cycled back into Cape Town. 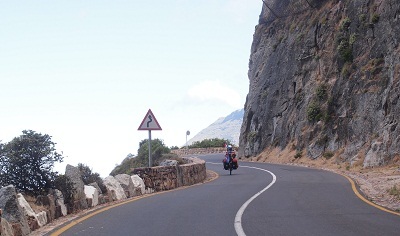 Part of the ride was on the Chapman's Peak Drive. It's a scenic toll road (though bikes were free) and â€œscenicâ€� doesn't begin to describe it. The road twists higher and higher above the sea, sometimes with only a low stone wall between you and sheer space. Spectacular views of the ocean and mountains came one after another. Notice the stone wall in the photo to the right. Below is the view over it! Following that, there is a photo taken at a rest area on the way down. 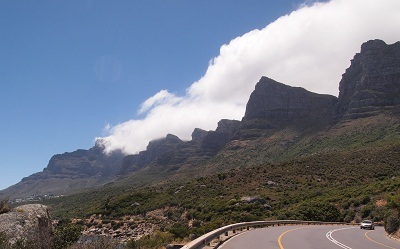 Soon we were back in high-end vacationland, Camps Bay to be specific, and we planned to cycle a steep road from there, passing the Table Mountain tram station, back into Cape Town. But have I mentioned the wind? It roared down the mountainsides, and combined with the steepness of the grade, it made the terribly difficult. We climbed for about 10 minutes, but unfortunately there were no distances on the road signs, nor on our map, so we had no idea how much longer we would have to climb. Wimps, we turned back downhill (fun!) and continued to follow the shore. 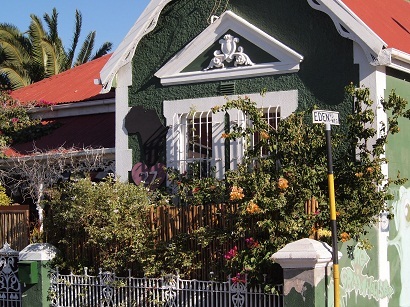 We had to ride straight through downtown Cape Town to reach our destination, the home of Wim and Hanlie Coatzee, in Salt River (a district near Observatory. Unfortunately, we have no photos from the time we entered the city until Wim and Hanlie's. We were too busy finding our way in heavy traffic to think about photography. And have I mentioned the wind? At every corner the wind seemed to howl from a different direction, threatening to knock us right off our bikes! Wim and Hanlie could not have been nicer. They were a young couple, at least by our standards, with a cute little boy, nine-month old Eland. Both Wim and Hanlie are adventurers. They've lived in several countries, including Iran, and have cycled from New Orleans to the Canadian border. In the evening, Wim's brother Flores, a strapping kite-surfer, and his wife Alberta, came over for a braai, and it was a wonderful evening for us.